Declaracion de Sely Es / Que es un Compendio sobre el Comento / de la Agada de Pesagh / que hizo Jeuda de Modna / sacado del libro le Hag Pesagh / del docto y gran maestro el S.r / Don Ishack Abarbanel. / Traduzido en Lengua Espanola p. orden de / Ishack de Matatya Aboab. / En Amsterdam en el anno 5453. Declaration of Sely Es [צלי אש], which is a compendium of the commentary on the Pesah Haggadah as composed by Yehuda de Modena, taken from the book for the festival of Pesah by […] Don Ishack Abarbanel [Isaac Abravanel 1437-1508]. Translated into Spanish by order of Ishack de Matatya Aboab. Amsterdam, 1693. Ishack de Matatya Aboab was one of the most important Amsterdam Jewish-Portuguese patrons of the 17th century, and an avid book collector. He dedicated this one to his son, David Aboab Curiel. p. 2: Foreword. Ishack de Matatya Aboab mentions that Isaac Saruco helped him with the translation of this work. 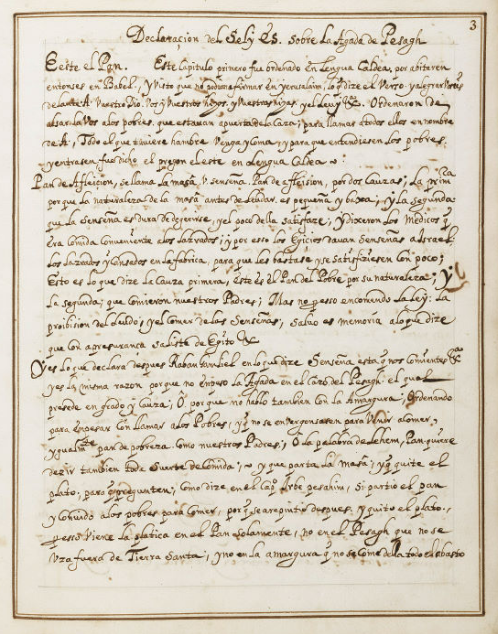 Dated: 8 Sebat 5453.
p. 65: Final additions: “Pensamentos ynovados, despois de haver ya escrito o antesedente, por cuya cauza, não acresentey cada couza aonde melhor viese ajustar”. p. 70-116: Printed Seder Haggadah shel Pesah. (Venice, 1629). p. 117: Portuguese annotations: “para David Aboab Curiel, meu filho. Ishack de Matatya Aboab” (to David Aboab Curiel, my son); “Os Hahamim da Mehilta forão os que ordenarão o seder da Agada” (The Seder of Agada was ordered by the Hahamim of Mehilta). Text in Spanish and Hebrew with some Portuguese annotations / Paper / 29,0 x 23,3 cm. / 69 pp. (of which 7 pp. are blank) / Regular Iberian writing / Title within linear frame / Same binding also contains: printed Seder Haggadah shel Pesah, paper, 24 ff. Venice, 1629.